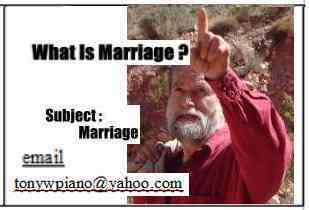 Do You have a REAL Knowledge of Marriage? How long does a marriage last? Who is family and how long do they remain family? Does sin and unforgiveness undo marriage? Does divorce make those who were family, no longer family? Does a marriage after divorce make a new family group? I share with you Because I care about you and I want God's best for you. we are not called to be followers of any people or group. We are called to be followers and proclaimers of God and of his ways. I do not want to be one of : Many will say to me in that day, Lord, Lord,... in thy name (I have) done many wonderful works? God's will is for us to live and be blessed and not that we suffer and die . If I say “Do not touch the hot stove”, and you touch it and get burned, is it my fault that you got burned? NO! You got burned because you did your own will and did not heed my instruction. So too we will reap the result of our own actions with God and his creation. The warning was of loving concern to protect you from harm. So too God warns us that we might live and not die. IF we will not heed his instructions and commandments we will hurt and suffer of our own actions. Sin is what separates us from God. If I tell a liar “God loves you” but do not tell them that God says they must not lie, I am keeping them from the love of God. If I tell a thief “God loves you” but do not tell them that God says they must not steal, I am keeping them from the love of God. If I tell an adulterer “God loves you” but do not tell them that God says they must stop committing adultery, I am keeping them from the love of God. It is bad for all if we do not share the warning and instruction of God. It is harmful for the individual if they themselves do not heed God's word. Click on The Adobe file with the red triangle and it will open in your browser. Does the mercy of God apply to you? You can save either file to your device and open them later. The "Rich Text Format" is a text file that you can edit.